When I saw the trailer to this movie few weeks ago, I was not so sure if this would be interesting. As my wife had mentioned it, it looked a bit like B class movie. However, since the main lead character was Tom Cruise, we decided to give it a try as usually his movies were generally good or full action. So when it premiered on Friday, we immediately bought the tickets. One interesting fact was the movie would only play in US cinemas in 4th week of September which was quite unusual as in the past few months, most movies were playing in US first before playing in Indonesia. Anyway, we should move on to the movie now. Barry Seal (Tom Cruise - so many movies to his credits) was a pilot in the TWA airlines who flew to various countries from 1970s. While going through those trips, he was also doing some petty smuggling. But it was found out by a CIA agent named Schafer (Domhnall Gleeson - The Revenant, Star Wars: The Force Awakens etc) who decided to recruit Barry and use his wit and exceptional ability of flying various airplanes to do some reconnaissance work on South American countries. Barry was told by Schafer not to share what he was doing for CIA even to his wife Lucy (Sarah Wright - Walk of Shame). During these "jobs" which were actually quite dangerous, Barry met with the Medellin cartel that included the would-be notorious Pablo Escobar in Colombia, They wanted Barry to smuggle cocaine to US through Miami. After some convincing, Barry finally agreed to assist them. Since Barry was no longer working in TWA and CIA was not paying good salary, Barry had to look for alternatives to settle his financial needs. This was when things got complicated for Barry as he would do various kinds of smuggling that would provide him lots of money albeit some of them actually assisted & arranged by CIA. With the additional assignment from CIA related to the smuggling of guns in Nicaragua, Barry had to juggle his time between so many flights from US, Colombia, Panama and Nicaragua. Not to mention the suspicions from DEA, ATF even FBI on his activities. Plus the complication when Lucy's younger brother JB (Caleb Landry Jones - Get Out, X-Men: First Class) came to stay in their home. So what would happen to Barry? Could he continue working for everybody and avoid being caught by the US agents? Find them all in this biographical crime movie. For a biography movie, this one was interestingly done. The way the story was told made it seemed quite fun. Some portions were using dark humor and Tom Cruise was real charming in here. I could actually picture him as this real unique character. His relationship with his wife and family was also real fun to look at, especially during the moment when he tried to convince her about the good about his works. One cool thing about the movie was the very good costumes and sets. It was like we were transformed into the world of the 1970s and early 1980s when the film was set. Especially the make up effects of Tom Cruise was also exceptional. He looked a lot younger than his actual age here. Even my wife was very amazed with his appearance and looks. In addition to the costumes and sets, the film was also having some songs from that period which enhanced the aura of 70s and 80s here. 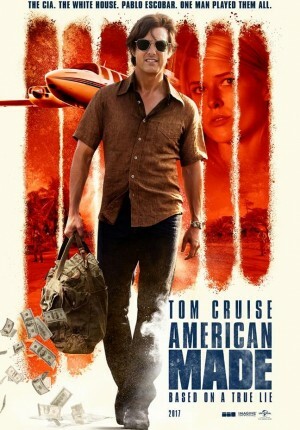 The main attraction of this movie was definitely the uniqueness of Barry Seal's life as a pilot and smuggler and also the impacts he had in the US history during the Ronald Reagan's presidency then. It even had some political figures mentioned as well. The title of the movie also suit the story very nicely. You would understand why it has such title by the end of the film. In the end, you could already guess the conclusion of the movie. Especially if you are a history buff who already knew the story of Barry Seal. There appeared to be various versions of his life story, so I am not sure either whether the one we saw here was the real actual version. But anyway, in term of entertainment, the movie was made into a non boring kind of biographical movie. However, those who were expecting to see Tom Cruise kick a$$ in this movie would probably be disappointed cause this is not that kind of movie. There were some action scenes but this film could not be categorized as action type. There were no very emotional moments as well (which I found rather odd as usually biography movie would have some of those parts). Finally, if you are looking for a good biographical crime movie, this one might be a good option. Though this was not as heavy as other movies in such category, it was still interesting to see Tom Cruise's portrayal of one of the controversial character in US history. It was also directed by Doug Liman who was the director of some good and/or commercially successful movies such as The Bourne Identity, Mr. & Mrs. Smith, Edge of Tomorrow and few others. But for those who are looking for movies with lots of actions by Tom Cruise, better wait for his next Mission: Impossible movies. The choice is yours!